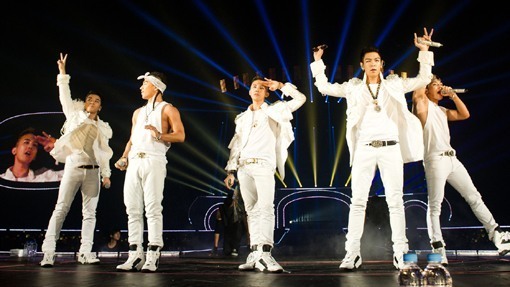 Big Bang drew the most fans in Japan among K-pop stars this year, a Japanese monthly magazine said Friday. According to Nikkei Entertainment’s chart of artists with the most concert fans, Big Bang took the second spot with about 920,000 fans in 29 concerts in total this year, Japanese rock band EXILE TRIBE topped the chart, attracting 1.05 million fans. About 32,000 fans came to each Big Bang concert. Big Bang held dome concerts for the second year straight this year. Member Daesung, who launched his solo career in Japan under the name of “D-Lite,” attracted about 170,000 fans to 15 concerts. If these are added to the group’s total, Big Bang has drawn about 1.1 million fans. This leads to about 110 billion won of concert ticket sales, industry watchers said. Meanwhile, TVXQ attracted about 700,000 fans, taking second place among K-pop stars, followed by EXO, Girls’ Generation and SHINee.